This book is about the Americans who tried to stop their nation from fighting in one of history's most destructive wars and then were hounded by the government when they refused to back down. 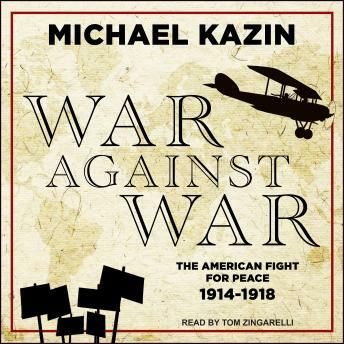 In the riveting War Against War, Michael Kazin brings us into the ranks of the largest, most diverse, and most sophisticated peace coalition up to that point in U.S. history. They came from a variety of backgrounds: wealthy and middle and working class, urban and rural, white and black, Christian and Jewish and atheist. They mounted street demonstrations and popular exhibitions, attracted prominent leaders from the labor and suffrage movements, ran peace candidates for local and federal office, and founded new organizations that endured beyond the cause. For almost three years, they helped prevent Congress from authorizing a massive increase in the size of the U.S. army-a step advocated by ex-president Theodore Roosevelt. Soon after the end of the Great War, most Americans believed it had not been worth fighting. And when its bitter legacy led to the next world war, the warnings of these peace activists turned into a tragic prophecy-and the beginning of a surveillance state that still endures today.